2 layers of sponge cake sandwich fresh whipped cream, strawberry jam and fresh strawberries. My take on a tea time classic treat. It's Cake Slice time again! Actually, I'm a day late. I wanted to join in on a little Presidents Day celebrations, so I made a..... wait for it.... cake! And I didn't want to bombard you with two cakes in one day. Because, well, I have manners. And self control. And moderation and all that good stuff. I must have been in a berry cake kind of mood too, because yesterday I shared a Blueberry Bundt Cake and today my cake has strawberries. I guess it is that time of year where berries are on my brain! Anyway, as always all of the choices for this month's cake looked great. I always have a hard time deciding. 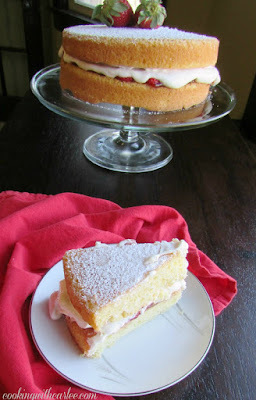 But something about this cake with strawberry jam and whipped cream sandwiched between its layers really called to me. It is a sponge cake, which really isn't my favorite texture, but I also haven't had that many. So I thought I should give it a try. Besides, I had all of the ingredients on hand, which is always a helpful deciding factor! My mother-in-law's birthday was earlier this month, so we invited her over for a birthday lunch that ended with this cake. Certainly nobody complained and it got eaten, but I must confess that sponge cake is still not my favorite texture. The only sponge cake that I've made that I would certainly make over and over again was actually a Cake Slice cake as well. It was the Coffee and Cream Sponge Cake from the last book. Honestly it is the frosting/whipped cream topping on that one that throws it over the edge. Spread it on cardboard and I am sure to still be writing love letters about it. But, I digress. Maybe had I made enough whipped cream to cover this cake, rather than just the smattering in the middle I would have liked it better. After all, we all know by now that I am a frosting girl and the more the merrier. This just didn't have enough for me! I did take the opportunity to add some fresh strawberries to the mix. They are not in Roger's adaptation, but the berries looked so good at the store that I came home with three pounds. It seemed a shame not to sandwich some between the jam and the cream! Of course Roger's picture was as pretty as could be. He suggested that this cake was named after Queen Victoria who is said to have enjoyed it with a cup of tea. They have been popular in Great Britain as a tea time treat since 1885. Perhaps that is my problem, I am used to celebration cakes that are really sweet and decadent and this is meant to be more of a tea time treat which I believe tend to not be quite so over the top sweet. Who knows? Either way, the cake did not go to waste! Preheat your oven to 350F and prepare two 9 inch pans. Cream together the butter and sugar until light and fluffy.. Beat in the eggs, one at a time until completely combined. Be sure to scrape down the sides of the bowl as you go. In a small bowl, mix together the flour, salt and baking powder. Stir flour mixture into butter mixture. Add the milk and vanilla and mix until completely combined. Spread in your prepared pans and bake for 12-15 minutes or until they test done. Cool for 10 minutes in the pans and then turn out onto wire racks to cool completely. To serve, spread jam over bottom layer of cake. Top with strawberry slices if using, the spread with fresh whipped cream. Top with remaining cake layer and dust with powdered sugar. Absolutely beautiful! I can see having a slice of this in the afternoon with some tea! Perfect dessert too for the warmer months after a light meal! Your cake looks wonderful. I think this was a popular choice this month. A tea treat, not a showstopper sweet cake, but yours is beautiful and I love the addition of the fresh strawberries! Originally I thought I pulled them on the slightly underbaked side, now I'm wondering if they weren't a big overdone. Who knows?! Either way, I didn't hear anyone complain. This looks so delish! I love cakes with just a sprinkle of powdered sugar!! Thank you. It is such a pretty and easy way to decorate, isn't it? Lovely and most certainly delicious. Thank you for sharing over at The Blended Blog. Pinning this yumminess right now. The cake turned out beautiful! I'm not a huge fan of sponge cakes either, but this one is drawing my attention! It's funny how seeing everyone else bake a cake makes me want to bake it too... every month! ;-) Thanks! I'm sorry to hear that this was not a favorite of yours because it looks delicious! I hope Val enjoyed her birthday celebration and her cake. It's so nice of you to make a special meal for her. It looks pretty "sweet" to me. Great pix! Thanks for sharing. I agree - the more cream the merrier :) The cake looks delicious though! Btw,I LOVE your logo. Pinned this beauty. Thank you so much, Jas. And pile on that cream! Your cake looks lovely. I'm sure your mother in law was very happy for the celebration! I hope so! It was nice to have a good excuse to enjoy a cake! I love the idea of adding fresh strawberries. I'll have to try that when we start getting good fresh ones. I am really excited that there are some good ones in our stores again. Thank goodness for those warmer southern climates! Carlee, your Victoria sponge looks lovely! (Is there a story about why you added an "n" to "Victoria"?) Funny, the very thing that makes you NOT a fan of Victoria sponges is the thing that makes *me* a fan! I love a not-too-sweet cake without frosting. Of course, I'm a tea drinker, so how well something goes with tea is my criteria! That is too funny... and there is a story, but it's not a good one. I had the post all written up and the photos edited and had hit publish before I saw that there really wasn't an N. Then I figured a little n wasn't hurting anything ;-) I really would like to be a tea drinker and enjoy tea time treats... but I just can't get myself to like tea for some reason. That cake looks scrumptious! I think it would be a good fit for our family as we tend to like things a little less sweet. This would be perfect for you then! Thank you! Victoria sponge is my go to cake. I rarely make anything else, I think it's because it's the one my mum made and her mum before that. It may be because we are English and this is what a basic, simple, go to cake is here. My nan taught me a slightly different recipe than yours but the result looks lovely, very traditional. My nan always put a paper doily on top of her cakes before the icing sugar so when it was removed it made a lacy pattern which she loved. I definitely need to get myself some doilies so I can do that! I did like that this one didn't call for whipping the egg whites separately, is that what your nan did? Hi Carlee, you can't beat a nice slice of Victoria sandwich sponge and typically English too. I'm a bit odd as I prefer it the day after it's been made, when the texture is slightly more moist. Hmmm, I bet I would like that better that way too! I would love to share and I am always happy to have an excuse to bake! Your Victorian Sponge Cake looks fantastic! We always love your recipes at Full Plate Thursday, thanks so much for sharing them with us! That is one beautiful cake! Thanks for joining the Family Joy Link Party! Oh yum! This cake looks amazing! Thank you for sharing at Merry Monday! I think the cake sounds delicious and it's so pretty, too. Thanks for sharing at Snickerdoodle. 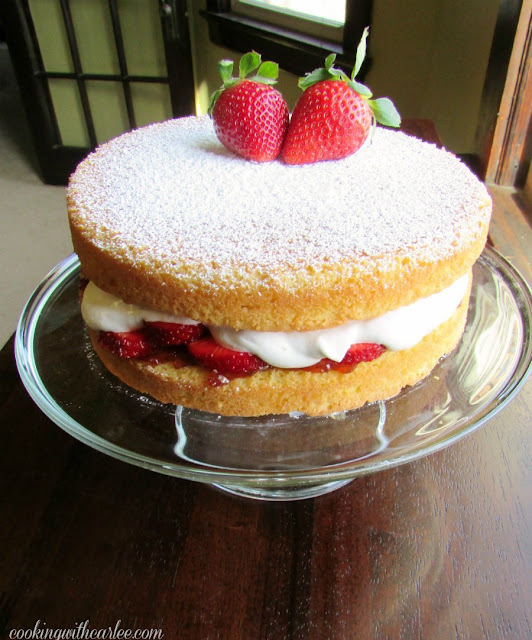 I'll be featuring your Victorian Sponge Cake at today's party. Hope to see you there! It been forever since I have had a sponge cake, but I seem to recall enjoying the filling more than the cake as well! Regardless, this is a beautiful cake Carlee! Me too, but that's no surprise. We all know my fondness for frosting and fillings. It was certainly tasty, just not my favorite. 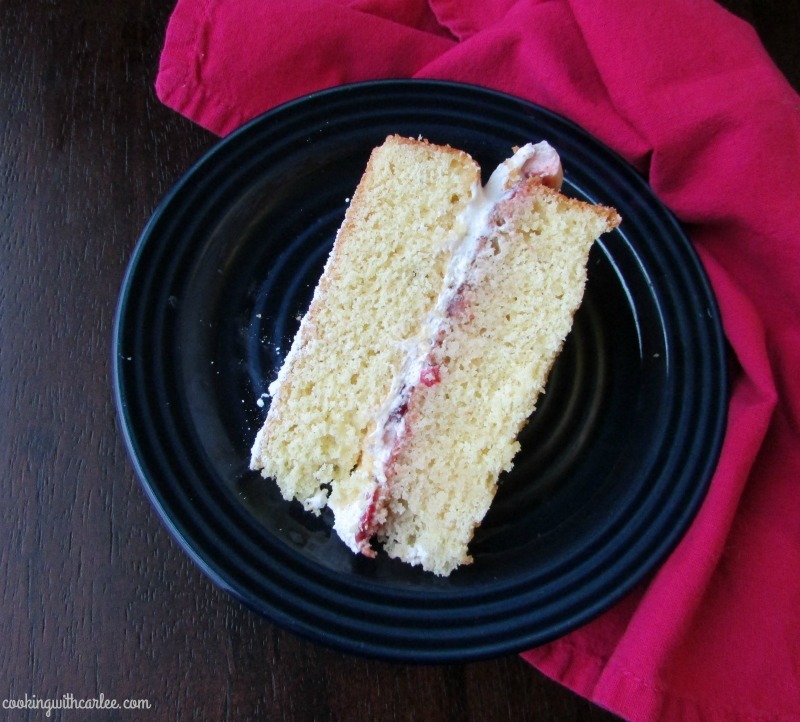 Your cake looks amazing and I love the ratio of strawberries to cream in the center.